The swingin' king of the jungle is back to go ape in a new dimension in Donkey Kong Country Returns 3D for Nintendo 3DS and 3DS XL! 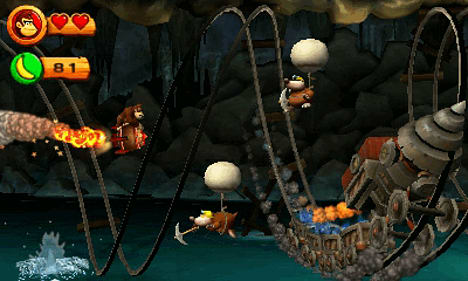 Donkey Kong and his simian sidekick Diddy Kong both return for more action-packed hi-jinks in this enhanced version of the classic Wii platforming game, giving you another chance to jump, race and roll across Donkey Kong Island in your quest to rescue the banana hoard from the troublesome Tiki Tak Tribe. 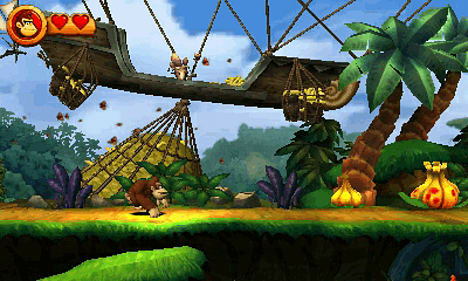 Donkey Kong Country Returns 3D brings the classic Donkey Kong platforming gameplay to Nintendo's newest handheld system. 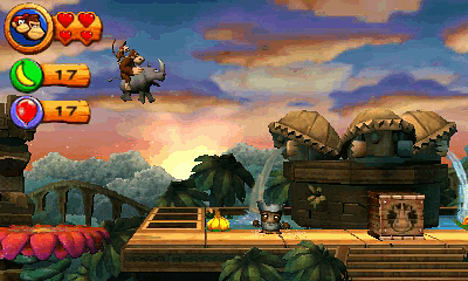 Overcome traps and obstacles, stomp on enemies, grab banana bunches and ride rockets, rhinos and more! And use Donkey Kong and Diddy Kong's unique special skills to succeed - hop Diddy onto DK’s shoulders and use his Barrel Jet to hover them both over large gaps, or roll to your heart’s content and trample everything in your path. 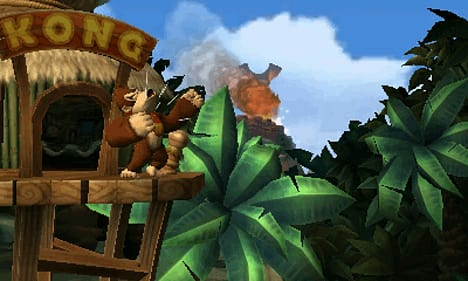 Donkey Kong Country Returns 3D lets you explore Donkey Kong Island as you tear through it, so keep a watchful eye out for collectibles on the beach, in the jungle and beyond. There are letters to find that spell out K-O-N-G and puzzle pieces to capture that will unlock Trophy Stages and other cool content. Conquer all these extra levels for another brand new surprise! Old-school players can re-live their Wii adventure in Original mode, but if things get too tricky, help is at hand in New mode. Making things a little easier, New mode gives Donkey Kong and Diddy Kong three hearts each instead of the usual two, letting them Kong-a for longer! Cranky Kong's shop has plenty of fun and helpful items for you to buy that will help save you from falls, allow the Mine Cart and Rocket Barrel to take a second hit, and even let you use a DK Barrel whenever you like, so don't be shy in spending those hard-earned Banana Coins! And if you don't want to go it alone, you can team-up with a friend in Local Play! Take on the whole game as the terrific twosome and pelt opponents with Diddy’s Peanut Popgun, hover using his Barrel Jet or slam bad guys into submission with Donkey Kong’s Ground Pound. The big guy can even do a Barrel Roll!